Los Cabos encompasses the two communities of San José del Cabo and Cabo San Lucas. These two communities are connected by a 20-mile stretch of four-lane highway along the Sea of Cortez coastline. Located at the southernmost tip of the Baja Peninsula, Los Cabos offers luxury, economy and tradition in an ideal Mexican paradise. Although they blend together like peas and carrots, each has their uniqueness and personality. When comparing San José del Cabo vs Cabo San Lucas, one might consider comparing twin sisters; one the consummate party girl, while the other refined and coy. As a local expat and realtor, I offer my comparison of San José del Cabo vs Cabo San Lucas. Cabo San Lucas is virtually a Mexican blend of Las Vegas and New Orleans. Once a sleepy fishing village, hundreds of hotel rooms, resorts and developments have sprouted from the desert in the past 25 years. To complement this tourist housing growth, restaurants, bars and nightclubs are found on every corner of downtown, along the beach and throughout the marina. These venues of carefree indulgence created and perpetuated the Cabo party lifestyle. Happy Hour begins at noon, or earlier, at many hotspots along the popular Medano Beach. Revelers drink, dance and play in the sand at one of the most popular beach party locations in the world. As the sun sets, Cabo San Lucas is just waking up as the party fever continues to rise. The laid-back bars transform into full-blown dance clubs pulsating with energy and vigor. Body shots, Jell-O shots and free pour shots flow liberally among the strobe lights and rhythmic beats until the very wee small hours of the morning. But it’s not all about the party. Tourist resorts attract families that require activities. Cabo San Lucas offers a cornucopia of water and other activities for couples, families and kids from snorkeling and diving to fishing and parasailing. One can even ride a water-propelled jetpack! For outdoor enthusiasts, many adventure tour companies offer zip lining, four wheeling, bungee jumping and camel rides along the beach. These adventures typically conclude with some sort of festivities. Indeed, wherever two or more are gathered in Cabo San Lucas, there is always an opportunity to raise a glass and dance to your favorite party tune. When it comes to comparing San José del Cabo vs Cabo San Lucas, it’s time to slow down a bit. Just as Cabo San Lucas is known for its party atmosphere, its sister city, San José del Cabo, is known for its culture and cuisine. Established in the mid-1700s, San José del Cabo’s colonial buildings, cobblestone streets and mission church flanking the town plaza manifests the richness of Old World history and charm. While a few of the beachfront hotels offer disco lounges after dinner, don’t look for nightlife here; there simply isn’t any. Instead, visitors stroll along the traffic-less streets and sidewalks, avoiding the sale’s hustle while peeking amid shops offering jewelry, unique handicrafts and clothing. At times, locals and tourists stop for a glass of wine or espresso at one of the sidewalk cafés. San José del Cabo boasts a thriving art community and galleries within the historic district where some of the original buildings are now home to the works of world-known artists. Known for its great assortment of restaurants, most are found within tranquil and beautifully landscaped courtyards where stringed ensembles stroll among the various locations serenading diners with a romantic ballad or two. Even the hotels within the historic district are boutique in size, but grand in their accommodations and luxury. 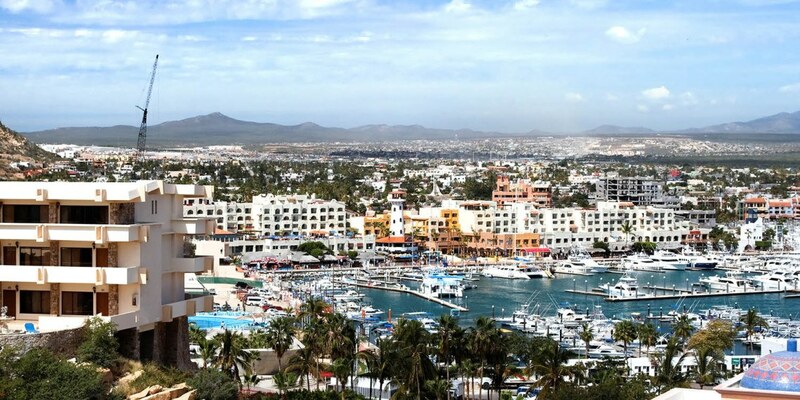 While Cabo San Lucas certainly has a following, many prefer the quieter laid-back environment offered within San José. When comparing San José del Cabo vs Cabo San Lucas, both offer fabulous dining opportunities, world championship golf, luxury resorts and beautiful beaches. For me, I prefer living in San José and visiting the nightlife in San Lucas when the urge arises. I recommend those considering a visit to, or a purchase in Los Cabos, indulge the opportunity to experience both communities and decide which is preferred. It’s like going on a date with twin sisters, either way you can’t lose! Contact me for more information on the comparison of San José del Cabo vs Cabo San Lucas. Thanks for the comment, Steve. I stumbled upon that comparison one day while trying to describe the differences between Cabo San Lucas vs. San José del Cabo. As I stated, I prefer residing in San José but, on occasion, it’s fun to enjoy a night on the town with that “wilder sister” as you say. Hope to see you in Los Cabos soon. Perhaps we could take the sisters out on a double-date? Glad you reposted your comparison on the two cities. It gives a great insight to the lifestyle in the Los Cabos area. Thank you reviewing and for your comment on the comparison of the two Cabos. If you have questions or if I may be of further assistance, feel free to contact me at your convenience. Thanks for sharing your ideas regarding the two communities Jud. I really never thought of it as what you have just shared. Hoping to see more comparisons from you! Great comparison between the two communities. In your opinion, which do you feel has greater growth opportunities in regards to real estate value and sustainability? Thanks! I put my money on San José and the East Cape. Contact me for more information and to discuss further. This was a wonderful breakdown and comparison, thank you so much! We usual spend summer vacations in playa car and riviera maya. This year when I heard it would be Cabo I was because I like a more relaxed and quiet vacation. Hearing about San Jose actually has made me so excited to visit this culturally rich destination . Thank you for your comment, Heather. Please advise me when you plan to visit as I would like to meet you and show you a few of the “jewels” of this work of art!